Shopping for everything from pin to piano is now done online, so how can shopping for groceries be left behind! From national players like BigBasket to Grofers and even Amazon, there are quite a few options to choose from, and each one offers the convenience of shopping while on the go! Give online grocery shopping a try and we assure you, you’ll never want to go the sabzi mandi in your life again. Not only are the veggies, fruits and other stuff of a better quality but you also save yourself the trouble of haggling for price with the vendors on the road. And just incase you find any of the stuff you purchased online not up to the mark, a lot of these portals/apps offer you the option of returning the same within 24 hours! So now why get stuck up with rotten lady fingers or cauliflower. Shop for the freshest of farm produce and get it delivered right to your doorstep! Here are the top 10 online grocery shopping sites & apps in India you can shop at. From fresh fruits and vegetables to packaged food items to home/kitchen utility products, www.bigbasket.com is a one-stop solution for shopping for anything that you need for your daily household chores. The services are available in Bangalore, Hyderabad, Mumbai, Pune, Chennai, Delhi, Noida, Mysore, Coimbatore, Vijayawada – Guntur, Kolkata, Visakhapatnam, Surat, Nagpur, Patna, Indore, Chandigarh Tricity, Jaipur, Bhopal, Ludhiana and Jalandhar. You can choose from over 18,000 products and 1000 brands including their private label brand across categories. BigBasket offers you the option to choose your delivery slot and even opt for an Express Delivery in case the items in your cart are available for the same. Various offers and discounts run through everyday and yes, incase they falter on their timely delivery promise or there are billing issues from their end, you are in for a special refund! 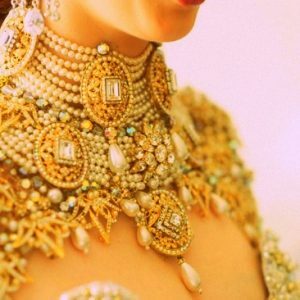 They offer ease of payment through various online payment options and even card and cash on delivery option. 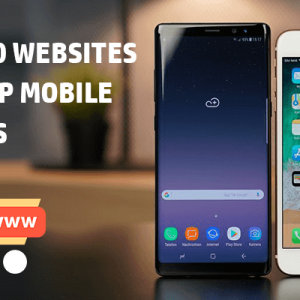 You can check them out here or you can download their apps on the Android and iOS store. 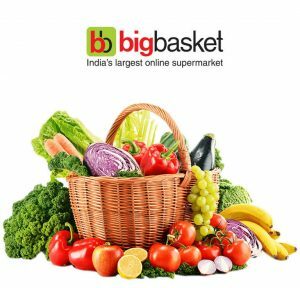 Get coupons of BigBasket on Greatbuyz for your online shopping. It hard not to notice the bright orange bag of Grofers with all the items ordered neatly tugged in during delivery. So the best part about ordering from Grofers is that the delivery can be directed to be left with the building watchman/security incase you are not at home. 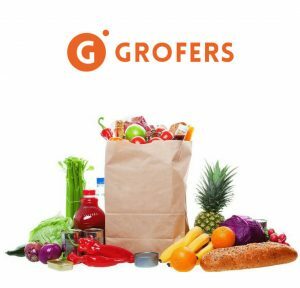 What makes Grofers different is the fact that they connect you to your nearest local supermarket/grocery store. Though they source locally, they take care of ensuring that quality and price isn’t compromised and you get the best of the products/goods at a discounted price. They offer a wide assortment of groceries, fruits and vegetables, cosmetics, electronics, bakery items, flowers and a whole lot more. In case you aren’t happy with the products delivered, you can have the same returned and a refund will be credited to your account within a couple of hours. Get coupons of Grofers on Greatbuyz for your online shopping. You may not have heard about them much but you would be surprised to learn that they are present across the major cities in India. The list includes Delhi, Ghaziabad, Faridabad, Noida, Gurgaon and major parts of Mumbai, Pune, Hyderabad and Bengaluru. 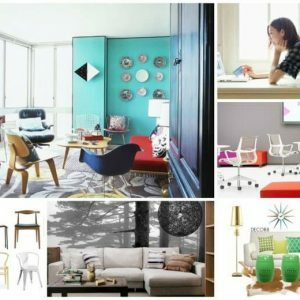 They work in partnership with major hypermarkets like HyperCITY and More. 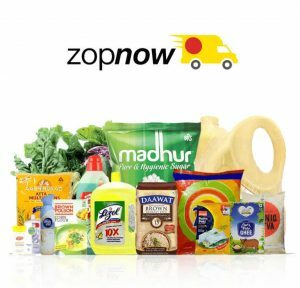 The advantage of shopping at ZopNow is a flat 3 hour delivery option or in case you want it at a particular time slot, you can opt for the same as well. Returns and refunds are easy and if the items fall under the non-perishable category then the return period is that of 15 days! They run a loyalty program as well and there is a separate section for various offers and discounts that makes shopping here a treat for your wallet! You can check them out here or download their app on the Android and iOS store. 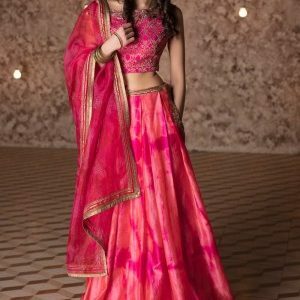 Get coupons of ZopNow on Greatbuyz for your online shopping. 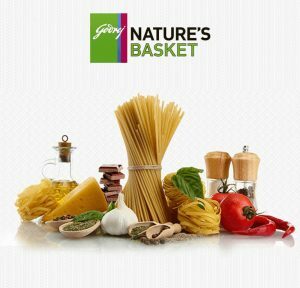 Nature’s Basket from Godrej has carved a niche for itself with a tempting range of gourmet foods and organic fresh fruits and vegetables. Try their bakery delights and you are sure to be hooked to their artisanal breads and cakes. 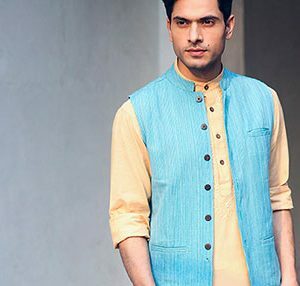 They began their journey with a store in Mumbai and with online shopping catching the fancy of everyone in India, they were quick to act and launched their online store as well. Though their presence is restricted to Mumbai, Pune and Bengaluru, the company aims to spread across key cities in India very soon. During festive period, they launch hampers with finest food products which can be gifted to your friends and family with pride and delight. You can check them out here or download the app on the iOS and Android store to avail offers. 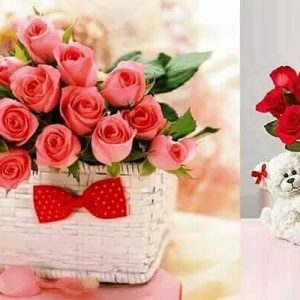 Get coupons of Nature’s Basket on Greatbuyz for your online shopping. 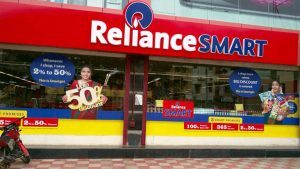 With services across Mumbai, Pune and Bengaluru, Reliance Smart offers you the convenience of shopping for everything you would need to run your house and all of it at discounted pricing. Imagine what a delight for a house wife to be able to get 1 kg of sugar for just Rs. 9 when she shops for Rs. 499! Great deals make shopping here a fun experience. Shop at ease for everything – be it fresh fruits, vegetables, rice, dals, oil, packaged food, bakery, dairy items, frozen, pet food, household cleaning items, beauty and persona care products and lots more. You can choose your delivery slot and payment option as per your convenience. You can check them out here & download their app on the Android and iOS store. 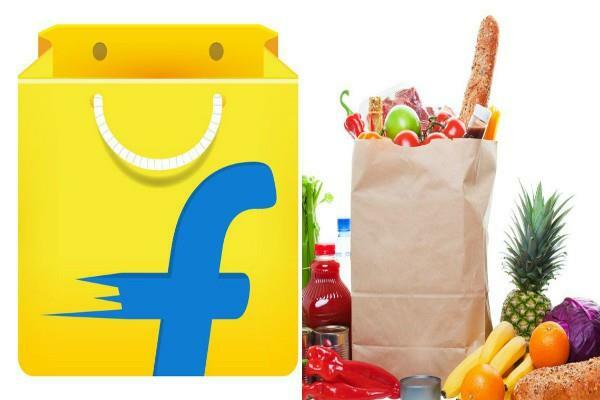 Riding on the back of everyday discounts, seamless delivery and superior shopping experience is Flipkart’s new grocery offering- Fipkart Supermarket. 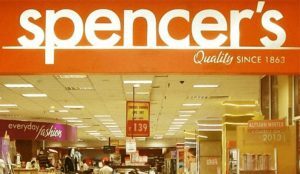 Launched in Bengaluru in August, the company plans to expand its grocery offering to 5-6 cities by end of 2018. The company focuses on customer experience and aims to display expiry dates on each product and guarantee fresh products to customers. It also offers preferred delivery slots for customers and has a range of staples and consumables under its own label, Flipkart Supermart Select. Amazon is not just the mother but grandmother of all online shopping portals/apps in India. They literally sell everything. 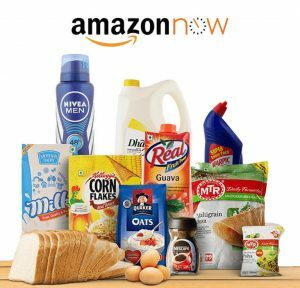 With Amazon Pantry, they entered the grocery category too where they give exciting discounts on packaged/branded food products. And with Amazon Now, they went a step ahead to offer fresh food as well. ill in your pantry box and avail of irresistible discounts and features like free samples and cash back. All of the pantry products are delivered the next day in a tamper proof Amazon packing. Amazon Now offers delivery within two hours of placing the order. 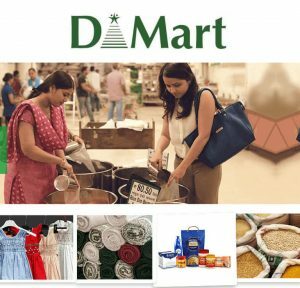 For those who have shopped at DMart, it is unlikely that they would visit any other hypermarket. This hypermarket major has now entered the online space and serves quite a few pin codes across Mumbai. They are yet to have an all India presence though. Shopping at DMart leaves you spoilt for choice! The offers and discounts are unlike any other and so are the options. What makes their online venture different is the facility of offering pick-up locations from where you can pick up your order incase they do not serve your pin code. If you are looking at stocking up daily essentials, make sure to visit their portal/app once and in case they serve your pin or one of their pick up location is accessible to you, don’t hesitate to fill in your shopping cart. You will soon get used to saving money big time here! They are present in Kolkata, Delhi, Lucknow, Hyderabad, Chennai and Vizag. With an option of free delivery on orders above Rs. 500, they are a perfect choice for online grocery shopping. Though the only drawback of shopping here is their return policy as the return can be done only at the store from where the goods were sent. But you do have an option of refusing to accept the delivery in case you find any of the products not up to the mark. For packed rice units, in case the packaging is open, no deduction will be made in case of weight loss of less than equal to 5 per cent. In case, the weight loss is more than 5 per cent then proportionate return will be made. Delivery slots can be chosen between 8.00 am to 10.00 pm. From the house of the TATA, Staquik is an online grocery store that has a range of personal care products besides daily utility items on offer. From farm-fresh vegetables to juicy fruits to carefully packed greens and frozen chicken, the website has it all and takes pride in delivery fresh and fragile items with utmost care. Buy dairy, bakery, eggs, dals and pulses from Starquik, and check out their Hot offers section for some sweet deals. Pretty post about Grocery shopping, thank to share your innovative ideas, keep more update. Online grocery trend is on a boom in India. People are interested online grocery trending. Its a good list, You can also add local banya, Awesome Dairy and not to forget that even flipkart has entered grocery segment.